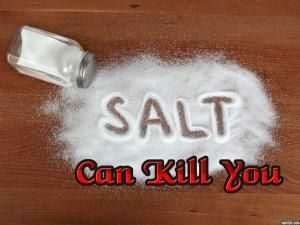 Big Salt and Big Food don’t want you to know the truth about how dangerous dietary salt really is. They use all sorts of tactics to confuse and mislead the public, so that the salt industry can continue making huge profits, and the food industry can continue producing cheap processed foods that rely on salt for flavour, rather than using natural ingredients (for instance, McDonald’s Big Mac contains 2.3 grams of salt 1 and a can of Baxter’s Cream of Tomato soup contains 2.6 grams 2 ): resulting not only in salt addiction, but also potentially in years of ill health and an early grave for their unwitting consumers. Is BIG Salt’s power at causing research bias just a Big Exaggeration? What are the daily salt intake recommendations? But how much salt is really too much? But what’s normal salt intake for humans? Not at all. There’s plenty of evidence 3 that when research fails to show a positive and clear relationship between increased salt consumption and increased health risks (including higher blood pressure, cardiovascular events and CVD deaths), there’s likely to be outside funding or outside pressure from Big Salt in one way or another – either directly, through financial bribes (they call it ‘funding’) or through having biased parties involved either in the research studies themselves 4 5 or in the organisations/companies responsible for the publication of the research results 6 7 , who may themselves move through a revolving door 8 between scientific research and working as senior executives within the salt industry. Same scenario as we see with Big Food 9 , Big Tobacco 10 and Big Pharma 11 . So, amongst all this confusion, where vested interests play such a major role, and where so many people are virtually addicted to the current high levels of salt in packaged, restaurant and take-away foods, is there any research data that proves definitively that salt intake is causally related to serious increased health risks? Two major long-term studies (Trials of Hypertension Prevention (TOHP), phases I 12 and II 13 ) followed two groups of randomly selected pre-hypertensive individuals for many years. They collected multiple 24-hour urine specimens from these participants during the testing period, to check sodium excretion. They then kept up surveillance after the trials to monitor whether there were any significant differences between the health outcomes of the two groups – those who had lower levels and those who had higher levels of dietary salt intake. A teaspoon contains 5.69 grams of salt (sodium chloride) 15 , which equates to around 2.3 grams (2300 mg) of sodium. The World Health Organisation (WHO) recommends 16 less than 5 grams of salt per day for adults (less for children). The UK National Health Service (NHS) recommends 17 about the same as WHO. The US Food & Drug Administration (FDA) also recommends 18 about the same as WHO. Remember, that a teaspoon of salt is not in addition to the salt that’s already in the prepared food you buy – and if you eat prepared meals, soups, sauces etc and jot down the amounts of all the added salt within them, you might be shocked by just how much salt you’re consuming each day. It may be comforting to follow the above recommendations if you simply believe that you can get away with only a teaspoon or so of salt a day; but there’s good reason why I and other non-SOS WFPB advocates suggest that it’s best to aim for zero added salt (and that includes the stuff hidden in prepared foods and sauces). 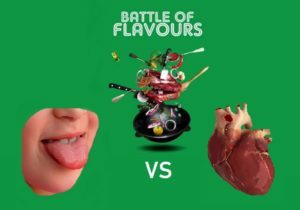 You can answer this by talking about the modern 21st century diets, or you can look back hundreds or thousands of years to times before salt was being used at all for preserving or flavouring foods. No doubt there would be similar controversy about distant historical facts, just as there is when discussing Paleo diets. What we ideally need is a modern population which eats the low levels of salt that pre-industrialised humans would most likely have eaten. 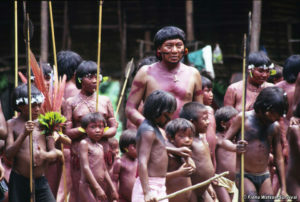 And, luckily enough, we have one: the Yanomamo Indians in the Amazon rainforest. These people have the lowest sodium intake ever recorded 21 . The researchers found that the blood pressures of the older Yanomamo were the same as those of adolescents 20 . They start out as children with an average blood pressure of around 100/ 60 and this optimally healthy blood pressure level remains the same for their whole lives, into old age. Indeed, researchers failed to find a single case of high blood pressure among their whole population 21 . So, unless you either cook the food from scratch yourself, you may find that pre-packed and restaurant vegan/vegetarian fare is just as likely to be over-salted as meat-based offerings. With the Yanomamo Indians, no processed foods were being consumed and no salt was being added to meals. That’s just what’s recommended in the non-SOS WFPB diet – no salt, oil or sugar being added (by food manufacturers or by ourselves) to the plant foods we eat.